I will post pictures of this new center, and the other fun things we have done so far this week tomorrow! Congrats to Kelly B. and Karyn W. you won my blog giveaway!! If you missed my recent post about the product exchange you can read about it here. 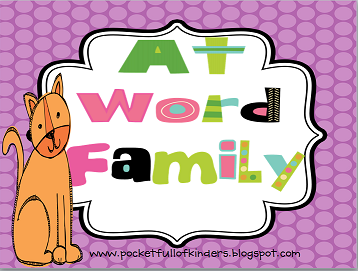 I had the opportunity to review the 'AT' Word Family Packet, created by Shuna from Pocket Full of Kinders. 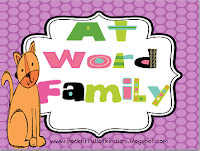 My students really enjoyed the activities (and we are actually still using them in our 'Word Work' centers). Kelly B. you won the 'AT' packet and Karyn won my Kindergarten Homework Packet. Yay! Thanks so much Nancy! I'm really looking forward to using this! Thank you so much! Do I need to contact her? Thanks! You have such a cute blog!!! Hop on over to my blog at www.hopkinshoppinhappenings.com because I just boo-ed you! Come check out the criteria if you want to participate!